Really helpful summary and pictures. Thanks, Art! Matt took the photos, and has said that he’ll get more in the spring; the tree should be looking really good at that point (certainly enough carbohydrate-storing root stayed with the tree to get it growing just fine). I’m curious here, do they spray any type of gel coating on the roots to prevent drying out during transport ? Thanks very much for the question! Nope, no coating applied at all other than water. 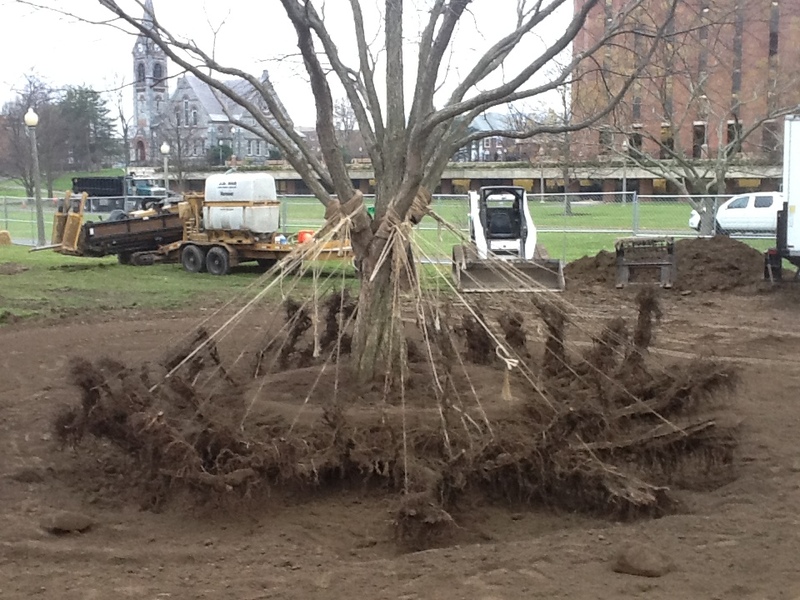 It appears that the root surfaces may dry out from having streams of air blown on them, and they will lose those tiny root hairs and some smaller roots, but regrowth after a tree has been set in its new home and mudded in does not appear to be a problem. A transplant may take place over a 24 hour period. Hydrating the tree thoroughly before a move (flooding it in these parts — we have nice sandy loams, in general, in this area — is a good idea) gives the tree a chance to bring moisture into its tissues before air exposes its roots, so that even with exposed roots it can safely transpire moisture through its leaves for the transplant period, without wilting. It may be that some mechanism shuts off transpiration during that time, or it may be that the tree has enough moisture stored to be able to accommodate the temporary loss of soil cover. Absorption and transpiration do continue after a transplant, though, and with such a great volume of roots saved, a tree moved bare-root in this way can do just fine during and after its move. When you consider how much root mass remains after a B&B dig, as opposed to how much remains with a bare-root dig, it’s pretty clear that the bare-root plant is going back into the ground with much better resources for successful re-establishment and growth. When I lived up in the San Jacinto Mountains in Riverside Co California, winter always brought mudslides down from road cut outs. Along with these slides came fortunate large Coulter and Jeffrey pine with entire root structures intact. Of course the mountains that high in winter back then were in a constant fog and dampness with misty rain, even when storms were long past. Putting them in the pickup truck was a challenge, but I got them home. Digging the appropriately sized holes was more of a challenge. What I noticed on the roots of the trees I planted was a thin layer of mud almost the consistency of fine clay, so nothing really dried out. I was just curious about such a large tree in sunny weather with that question. I’m going back to the states this coming April and looking forward to it. I’m tired of wet, cold and darkness. Looking forward to photographing and documenting some habitat losses up in the mountains. Losses have happened faster than people actually know. 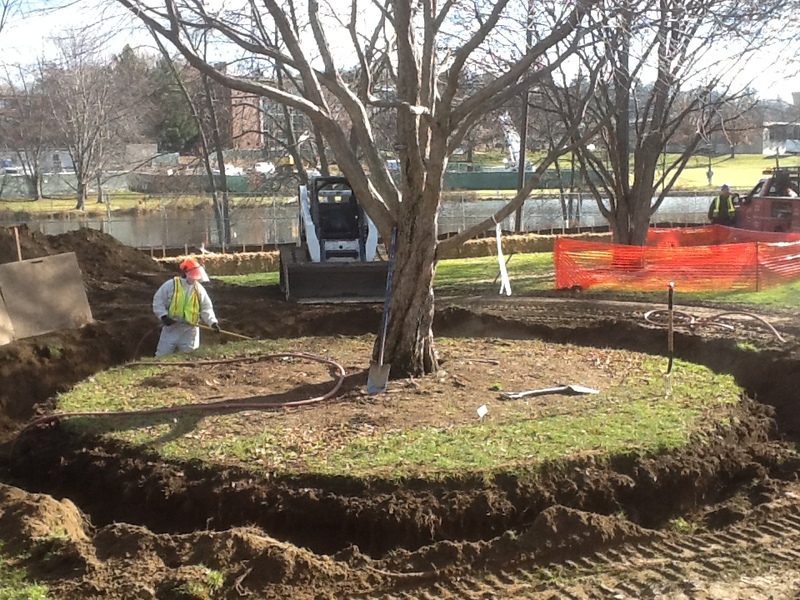 We are Landscape Contractors in Plymouth, MI and are moving a 12″ DBH Weeping Cherry in a few weeks using the Air Spade. We have moved Japanee Maples and Dogwoods before with good sucess but have never tried a Cherry. 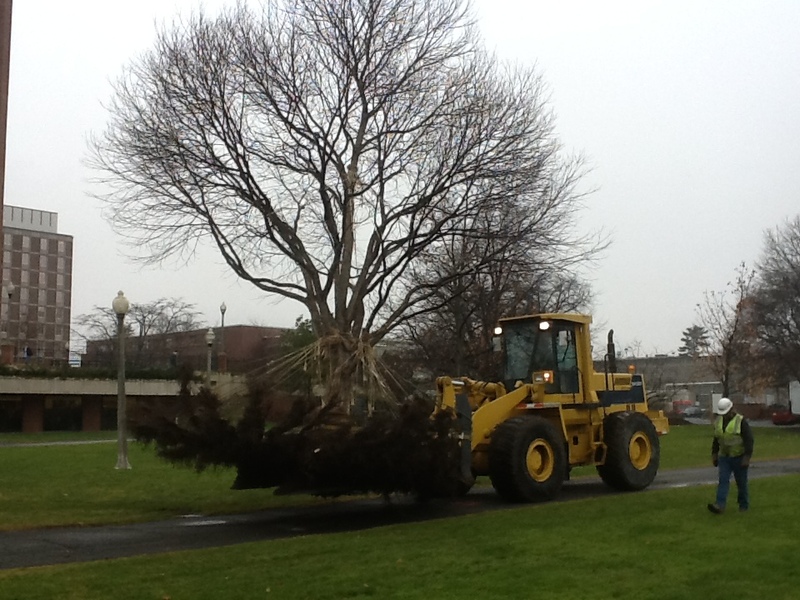 The tree is going to be moved about 30′ away from an existing sidewalk to a more open area. I would like your input. Thanks! Mark, thanks for your note; the cherry sounds like a good project. If you want to reach me directly, go to my profile at LinkedIn (I’m Principal at Wolf LightHall Inc), and drop me a line — I’m happy to pass along anything I know about cherry trees. Seems like a substantial waste….why not propagate more of them, biannuallyor triannually and always have a growing supply rather than all these resouses employed inefficiently to move one on campus….the footprint immense! Excellent question, and you’re right; the footprint is quite large. But consider the idea of propagating more trees, which is one I like at first blush, and at second — but which in this part of the world may be quite impractical, and engage a much larger footprint than moving a single specimen tree. Here, where open land is getting scarcer by the day, the choice to grow trees is really a land-use decision. Nurseries in New England have been going out of business in droves in the last twenty years; development pressure is incredibly high, and much more money can be realized in the short run by selling for development than for growing trees. And that means that growing trees gets really expensive. It’s an unhappy reality. 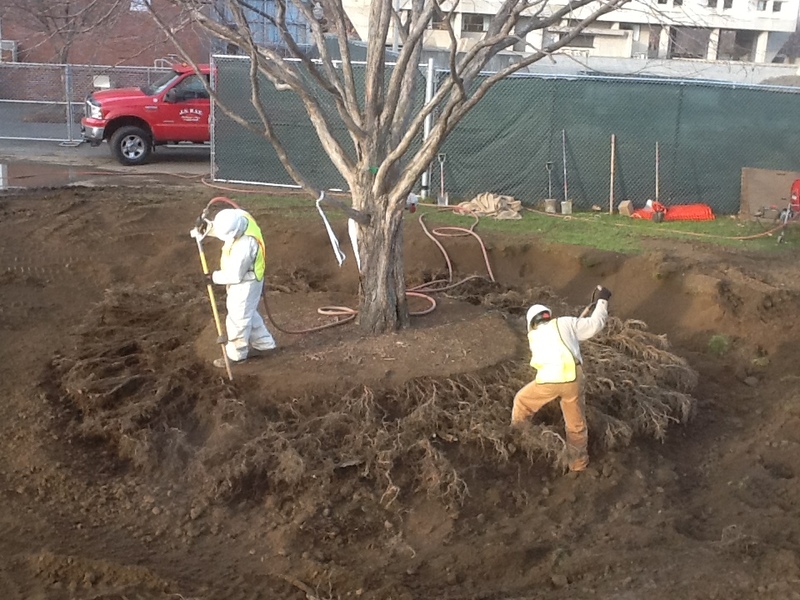 Air-tool transplanting is not suitable in every situation by a long shot, either; specimen trees often get the special treatment, because they have grown into habits that cannot be found in juvenile specimens, and their maturity and stature give a property a well-established look from Day One.